Uncle Petros and Goldbach’s Conjecture (2000) tells the tale of brilliant mathematician Petros Papachristos, who devotes his life to solving a notoriously difficult problem. 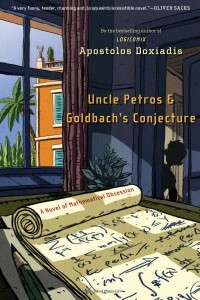 His young nephew’s passion to unearth his secret leads to a fascinating denouement which reveals the full existential grandeur of Petros’s dream and the deep mystery of mathematics. This moving novel is an international bestseller, currently translated in twenty-five languages. Together with a handful of other books it is credited with the invention of ‘mathematical fiction’. Goldbach’s Conjecture (GC) was first stated in 1742, in a letter written by the minor mathematician Christian Goldbach (tutor to the Czar’s children) to the great Swiss mathematician Leonard Euler. A conjecture in mathematics (as in real life) means a statement that, although suspected to be generally valid, has not been proven. Goldbach, in his letter, pointed out to Euler his observation that “every whole number greater than six seems to be the sum of three primes”. He checked it against thousands of cases and always found it to be true – but the whole numbers being infinite, only an abstract proof would cover the general case. This he could not find. a) Every even number is the sum of two primes. b) Every odd number is the sum of three primes. Today, the former is known by mathematicians as “Goldbach’s Conjecture” while the latter is known as “the second”, the “other” or the “weaker” GC. The second GC was proven in the mid 1930’s by the great Russian number theorist, Ivan Vinogradov. But the first, or GC plain and simple, (“every even number greater than 2 is the sum of two primes”) has still to be cracked, even though some of the world’s greatest mathematicians have tried their hands at it. Because of its notorious difficulty, GC is not the kind of problem that attracts many top class researchers today. Few people want to waste years and years working on a problem that in all probability they will not solve. Mathematics, like all scientific disciplines, is ruled by expediency and fashion, and the classical problems of number theory are not currently deemed ‘à la mode’. One more reason that a major breakthrough with GC seems unlikely in the foreseeable future. The closest anyone has come to proving GC is a theorem of 1996 by the Chinese mathematician Chen Jing-Run. It proves that “every even number greater than 2 is the sum of a prime and an almost prime – ‘almost prime’ meaning a composite number that has at most two factors.” Although this may sound extremely close to GC, unfortunately there is no obvious step from one to the other. Kurt Gödel attended school in Brünn, completing his studies in 1923. He is best known for his Incompleteness Theorem. TIME Magazine has recently declared him to be the leading figure in mathematics in the twentieth century. G H Hardy was a pure mathematician who hoped his mathematics could never be applied. However in 1908, near the beginning of his career, he formulated a law describing the proportions of dominant and recessive genetic traits that would be propagated in a large population. Hardy considered it unimportant but it has proved of major significance in the study of blood group distribution. John Edensor Littlewood is best known for his collaboration with G H Hardy on summability, function theory and number theory. Srinivasa Ramanujan a poor clerk from India with little formal education, was one of the world’s great mathematical geniuses. He made substantial contributions to the analytical theory of numbers and worked on elliptic functions, continued fractions, and infinite series. Alan Turing held that computers would in time be programmed to acquire abilities rivaling human intelligence. His work was fundamental in the theoretical foundations of computer science. Andrew Wiles is the man who managed to prove Fermat’s Last Theorem. He first published a proof in 1993 but a subtle error was discovered. Although too old by mathematical standards (40 years old), he gave it another go and managed to prove the Theorem a year later. The Mac Tutor History of Mathematics Site contains the biographies of more than 1100 mathematicians, accessible from a selection of alphabetical or chronological indexes. Constantin Carathéodory considered to be the greatest modern Greek mathematician, made significant contributions to the calculus of variations, the theory of point set measure, and the theory of functions of a real variable. Mathematics by Topic contains a host of links covering all the major areas of mathematics. In each section there are links to electronic journals, websites, databases and other relevant material. The American Mathematical Society was founded in 1888 to further mathematical research and scholarship. The Society currently has approximately 30,000 members throughout the United States and around the world. It fulfils its mission through programs that promote mathematical research, increase the awareness of the value of mathematics to society, and foster excellence in mathematical education. The Prime Pages contain links to a number of sites relating to Prime Numbers, including articles and programmes useful in proving primality. The Number Theory Web is an attempt to use the resources of the World Wide Web to collect and disseminate online information of interest to number theorists everywhere. One generally doesn’t speak the words “prime numbers” and “seven-figure prizes” in the same breath.